The health benefits of a vegetarian diet are well-documented, as are the increased risks of heart disease and cancer that come with eating meat. But these are “merely” personal benefits, and personal risks. Most people will say that this is a personal “lifestyle” choice. Yes, I agree. What you do with your body – is certainly your choice. However, the decision to eat meat or not to eat meat is actually broader than personal lifestyle. 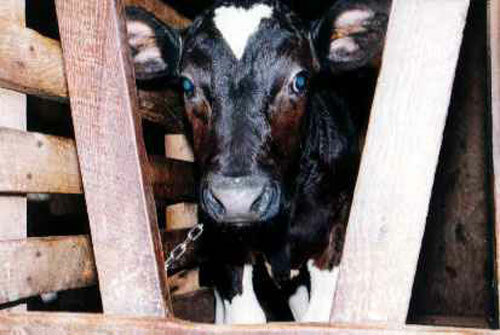 With the advent of factory farming, other factors have to be considered.Modern meat production is a completely automated, mechanised industry with billions of animals spending their entire lives – 24 hours a day, seven days a week – in tiny pens or cages, never seeing the sun, never feeling fresh air, never being allowed the freedom to walk even one step. By eating meat you not only decide on a lifestyle for yourself – you decide the cruel life of these animals. How many of us can remain complacent in the face of such institutionalised cruelty? Did you know, for example, that 70 % of the grain grown in the United States is used to feed animals destined for slaughter? Or that 80% of the water used in the States goes toward animal agriculture? Or that land growing potatoes, rice and other vegetables can support 20 times as many people as land producing grain-fed beef? Or that many leading scientists now rank the environmental damage caused by the meat producing industry as second only to that caused by fossil fuels? By eating meat you not only decide on a lifestyle for yourself – your decision influences the environment, global hunger and the cruel life of these animals. Don’t be cruel – be a vegetarian! There are plenty of valid arguments for improving the methods of mass-farming with an emphasis towards ethical practices and sustainable environmental impact. To suggest however that the solution to this matter is simply for everyone to swap bacon for broccoli is about as utopian as to expect every AIDS victim to commit suicide in order to get rid of the disease. very short and to the point . well stated. Next year will have been 40 years with out hot dogs for me. Can you share the source for the quotes on 70% grain and 80% water usage .I have heard it before but never found the source.. thank you so much . PS love the Thai pics.. Thank you so much for your comment. And congratulations with the 40 year anniversary…so many lives saved – it makes me happy to think about it. I got the number from a book by a man called Richard Schwartz. It’s a book about judaism and vegetarianism (see comment above by the author :-)). PETA has the same numbers and I found the same numbers in a brochure by the organisation “the supreme master ching hai international association”. They have a lot of good information. * the production and consumption of meat and other animal products arguably violate basic Jewish mandates to preserve human health, treat animals with compassion, protect the environment, conserve natural resources, help hungry people and pursue peace. Thank you so much for your valuable comment on this very important issue. I am honered to have you, being the expert you are on animal rights and Judaism, comment on our website. Wonderful tribute. Please feel free to share your knowledge. You can also purchase an all natural fed cow and split it with your neighbors. This would be a pretty well treated animal what was free and allowed to graze. The current methods of the factory farm are cruel, but eating meat is also about as natural you can get when it comes to the entire history of humanity. Also, I believe it is only red meat that leads to heart disease and cancer. Fish is one of the healthiest things you can eat, as long as the water from which it came was not polluted. Just a travel question: How could you survive in Central Asia without eating meat? Everything is a Kebab and I didn’t see too many vegetables in the desert. Really interesting talk by OSHO on why to be a vegetarian. Discovered your website by accident. Enjoyed watching your you-tube travel videos. I must say you are very very camera friendly.